CBR is the most advanced carbon bicycle ‘hospital’ in the UK. and mechanical problems dedicated to getting you safely back on the road as quickly as possible. Lead times vary depending on the type of work being carried out. Not fast enough? Our express service might be what you need. Please contact us for more information. We utilise flaw detection technologies to inspect hidden problems on your carbon fibre frame. Find out how our inspection process works. 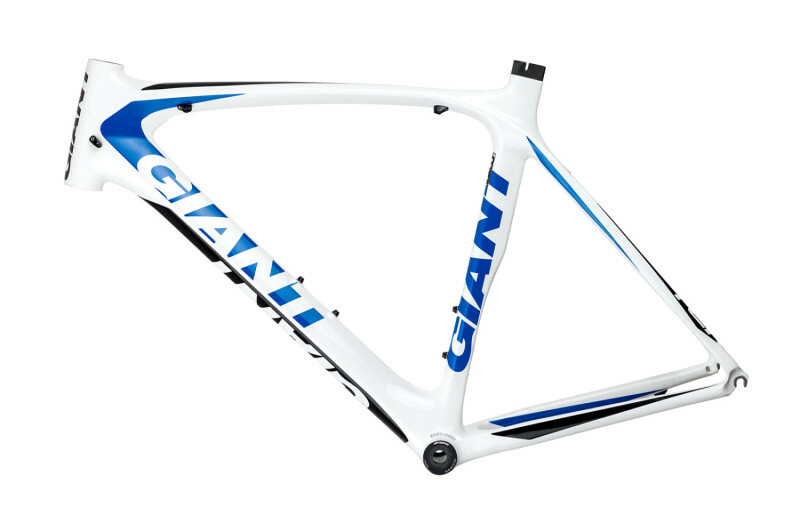 Damage to your carbon frame isn’t the end of your bike. We safely repair and warranty thousands of fractures and paint damage to new again. We are renowned for the quality of our paint restoration projects on new and vintage bikes and ensure the value is retained no matter what brand. Why not service when in for a repair? We can also convert and customise your frame for electronic shifting to ensure a seamless, trouble-free ride. Our support team are ​available to answer any questions regarding the repair and finishing options for your bike. Customers can now make informed decisions with ​an understanding of our safety record ​​and the quality of our work. There are no substitutes for technology and expertise to confirm the health of your carbon frame. 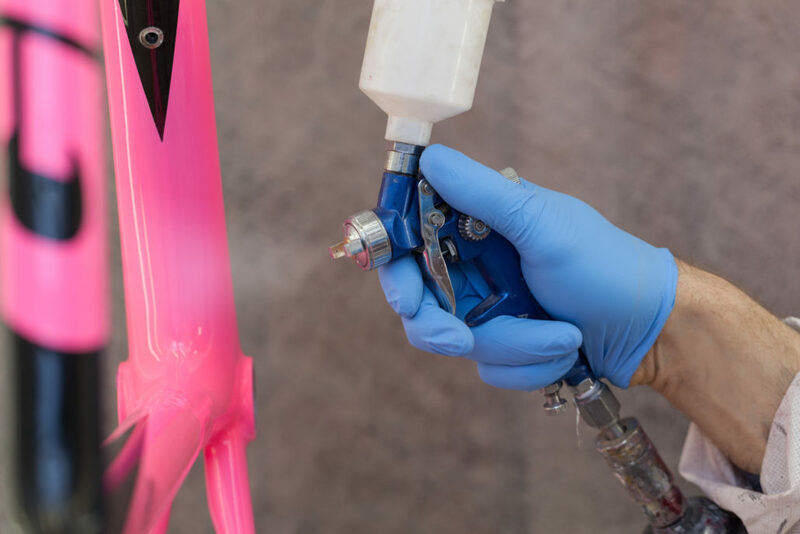 Here at Carbon Bike Repair we ensure that the repair ​is ​​executed to the required standard and the ​paint ​finish matches the quality of the repair. Using a range of flaw detection apparatus, every part of your bicycle is inspected, from the carbon components, brakes to bar tape. The process involves reviewing incident reports (where available), analysing both the carbon and mechanical parts of your bicycle. Digital microscopes and thermographic ‘x-ray’ are also used to detect and confirm findings during the inspection. If we find a problem the full details and repair costs are included in a report. We also offer formal reports to assist with insurance or warranty claims. Please contact us for more information. There are many other damage points not represented on this diagram so don’t worry if yours is not ​here. It is only a guide and will assist you in identifying the parts of your bike. This frame shows that fractures can be safely repaired and restored to new again (see 1-4).  Our owner lifetime warranty is often more comprehensive then some manufacturer warranties on new frames. A cracked carbon frame or a damaged wheelset does not have to keep you off the road for long. 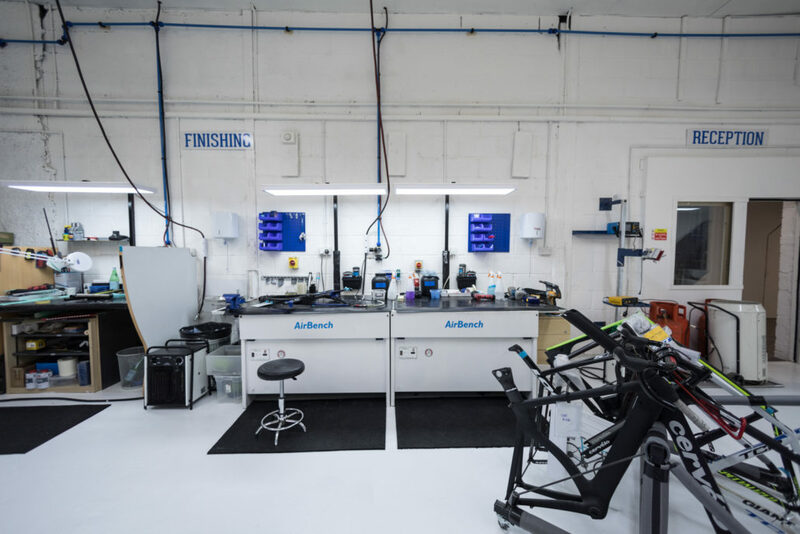 Our carbon repairs are performed in the worlds most advanced carbon bike hospital. There are 2 parts to the repair process: the repair of the carbon fibre and the retouching of the paintwork. 70% of our customers opt for a factory finish to their repaired bike. This is something we are credited for in the cycling world. A protection coat of paint is applied to the repaired area in a clear solid, gloss black. The paint is not matched or blended but is neatly masked off to create a block / collar affect. Please ask for details. The graphics and paintwork are replicated and replaced to factory finish, where possible. Any sign of the repair is ‘removed’. This includes official logos, decals, colour matching* and blending. *We colour match as close as possible to the manufacturers specification and the age of the bike. WHILE YOUR BIKE IS WITH US WHY NOT GET IT SERVICED? We tune-up every element of the bike from standard servicing to carbon component modifications. CBR has one of the most comprehensive trade partnerships available so there’s not much we can’t order in. We can make carbon modifications for electronic groupsets. This includes reshaping moulded cable housings, drilling holes, removal and in-filling of riveted cable stops. For those unsure of what conversion to opt for, our advisers can guide you towards the right choice for your model and budget. 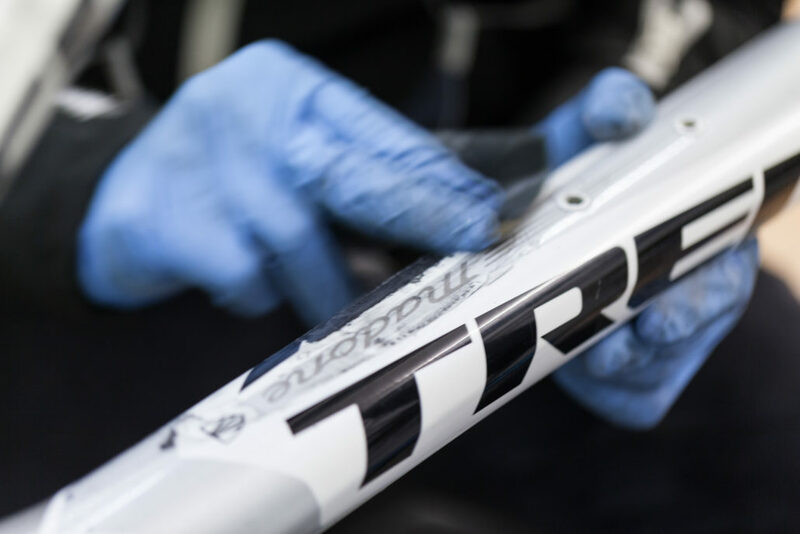 Read our guide on how to prepare your bike for a service. We don’t only repair frames. On occasion bikes are surface damaged and require a sympathetic retouch to ensure the paint work is restored accurately. 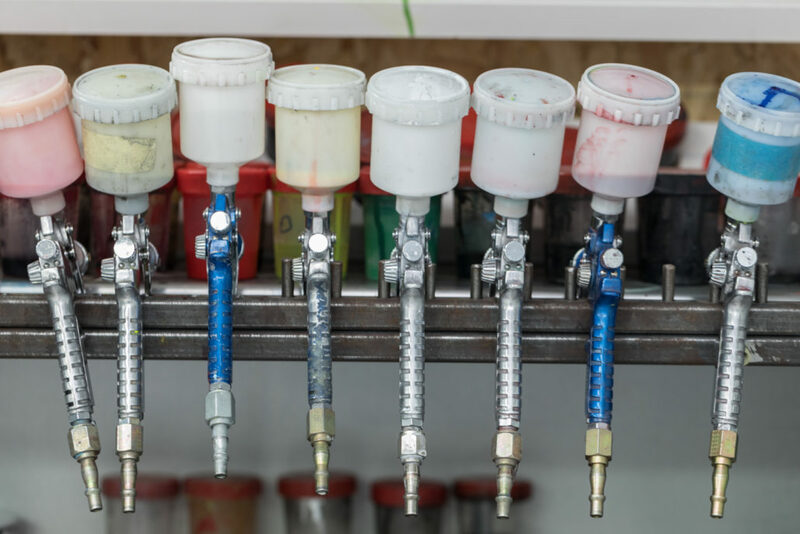 Every retouch job is scanned to confirm the manufacturer’s paint process and ​restored to original. If you ​require a carbon inspection before proceeding then please request this when contacting us. Please also include a description of the damage as well as how it occurred. This will assist us in providing you with a quotation. We may not be able to see the extent of the damage in the photos provided thus any quotes and timescales provided are only estimates. Once we receive the frame, we will send a ticket via email confirming the price of the repair for you to authorise before any work commences. IS WHAT WE DO SAFE? CARBON FIBRE IS INFINITELY REPAIRABLE HOWEVER SAFETY AND QUALITY CONTROL OF OUR REPAIRS IS WHY WE ARE THE ​MOST ADVANCED BIKE REPAIR SERVICE IN THE UK. If we repair it is because it is safe to do so. Safety is determined through technology and training. CBR is the most widely used repair service in the UK. We service all sectors of the industry from insurance to manufacturers, ​racing teams and individual cyclists. With a thorough process ​that ​warranties the integrity of the repair you can avoid the cost of a replacement frame or wheelset. We are so confident that our carbon fibre repairs come with an owner lifetime warranty and one year warranty for our paintwork*. 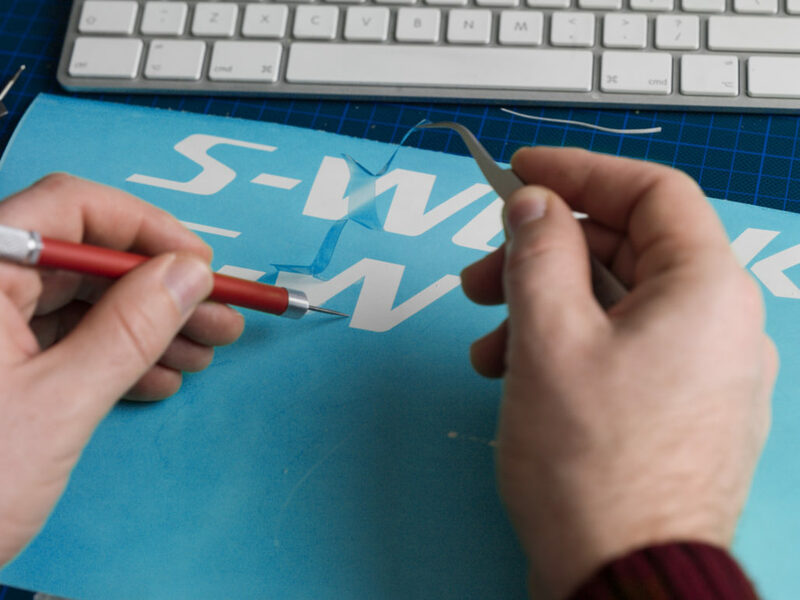 Our service team includes carbon fibre technicians, composite engineers, bike mechanics, spray painters and graphic designers. It is great to be a part of a team that delivers real world solutions to cost saving and unnecessary waste. Composite carbon inspectors inspect and report on the state of the carbon component. Our bike specific spray team colour match and restore up to 80 leading brands to factory finish. Our workshops are run by strict compliance guidelines to ensure safety and quality at all times. Our repair teams are highly trained and monitored to deliver 100% safe repairs 100% of the time. Is my bike worth repairing? That depends on the value of a replacement frame. A qualified repair is largely indetectable so if you love your bike then there is no replacement value. A well executed repair will bring it back to exaclty how it was before. Our advice is get a quote before you do anything. Will my repair be safe? The repairs are made to the specification of the component. Only qualified technicians should repair your bike. Unless otherwise stated, our repairs have an owner lifetime warranty and a one year warranty for the paint work. Please contact us for full warranty terms and conditions. Why is repair so expensive? A repaired warrantied frame is roughly less then half the cost of a mid priced replacement frame. If you are looking for the cheapest repair quote then this is one area you should not compromise your safety on. If you think it is too expensive ask us to explain. The repair itself can take a day. However it is the whole process, such as curing times, profiling, quality control which needs to be taken into consideration. Some repairs can take a few days if additional processes are required to achieve the specifications to pass QC. Unfortunately it takes longer in practice when we are in demand. Safety first as always. What parts do you not repair? In most cases we can repair about 90% of a carbon bicycle safely. There are occasions where some bicycles are blacklisted due to inherent design flaws. Due to comparative costs, it is better to replace some components than attempt to repair them. CBR inspects each component before we decide to repair or replace. Can you repair carbon wheels safely? That depends on the value of a replacement wheel. That should be your first option. Wheels are more complex and dangerous than frames when they fail. The tensions are great so a cautious review is undertaken before advising on a repair. Some wheels are very expensive to replace and in some cases are easy enough to repair. Others can be to risky to attempt a repair. Your safety is always our top priority. Can you repair carbon dropouts? Carbon dropouts are made with specific carbon fibre. The repair undertaken requires the correct tensile carbon otherwise it will not hold the rigours or gear shifting or derailleur removal. We can not weld alloy dropouts in carbon frames. Can you repair seat posts? It depends where the issue is. Always ask regarding your specific issue. How close can you get the restored part to the original? Restoring bicycle paintwork is not like the auto industry where paint codes and suppliers are known. Even if paint codes are known, no two paints when mixed are exactly the same. Our QC policy is 95% – 98% unless we stipulate before hand that designs or paintwork are simply not replicable. In most cases our restorations range between 98% – 100%. All art works are original or precise replications which we create in-house. We have 30 years combined experience in the spray team. CBR’s repution attracts clients and top race teams from all over the world. How much does it cost to restore my bike after the repair? Prices start at £96 (incl vat). Fill in our ‘Request a Quote’ form and we can assess your requirement. The cost depends on the complexity of the area restored, number of colours and graphics, if any. Once inspected you will be notified before work commences. You can always opt for the cheaper finish and return at a later date if you wish. Do your restorations have a warranty? All our paint restorations have a one year warranty. Please contact us for full details. If I want to sell my bike what do I tell the buyer? The buyer is free to contact CBR to assesrtain the origins of the repair with your permission. At CBR our repairs, unless stated, have an owner limited lifetime warranty and our paint work has a one year warranty. Please contact us for full warranty terms and conditions. If I am driving, how can I find your premises? Please follows signs for Business Park 6 & 7. Take the turn off for Alsford Timber and the D&T Hand Car Wash. Access to the premises is to the right of the car wash entrance. This road takes you under the bridge. Please only park in bays marked ‘CBR’. There is parking in front of unit 5, otherwise drive on and park round the side of the units in the ‘CBR’ marked parking row. Leatherhead train station is a short distance away and there are numerous bus stops nearby. Leatherhead train station is only 50min from either London Waterloo or London Victoria train station. We are a short walk from the station, approx 12-15 minutes. When you get to the round about take the first exit and remain on the left. You will see Key Drive Car and Van Rental and Alsford Timber, take this road and walk down to the D&T Car Wash. To the right of the car wash is the road which will take you to the Bridge Works Industrial Park. Please follow any ‘CBR’ signs. Here are some helpful tips on how your bike / part should be prepared prior to us receiving it. Please download, complete and attach the following booking in form to your bike. Please email or call us on 01372 372 766 and book in your bike prior to shipment or drop off. This is so we can control our turnaround times. We require stripped, clean frames for inspections and repair. If you are unable to fully strip your bike your local bike shop should be able to assist you. Please clean the part(s) as much as possible, any bike sent to us in an unacceptably dirty condition will need to be washed at a charge of £20 (incl vat). If the damage is around the seat tube or seat clamp area please include the seat post and seat clamp when sending the bike. If your drop out is damaged please make sure you send in your hanger. Come and see us, we like to meet our customers. Please make sure you have booked in your bike or have arranged a suitable time, especially if you want a technician to look over your bike there and then. Please place it in a suitable padded box to minimise damage and for re-posting. We like to send it back in your box to minimise packaging costs so make sure the box is going to last 2 trips. Please label your box with return details. We will arrange a suitable courier and contact you before returning. Please download, complete and attach the following booking in form to your bike prior to shipping. Head for the Hills is an independent bike shop who kindly assist CBR customers with bike drop offs and collections at weekends. They can also provide any strip and rebuild services you may require. This would need to be arranged with them separately.